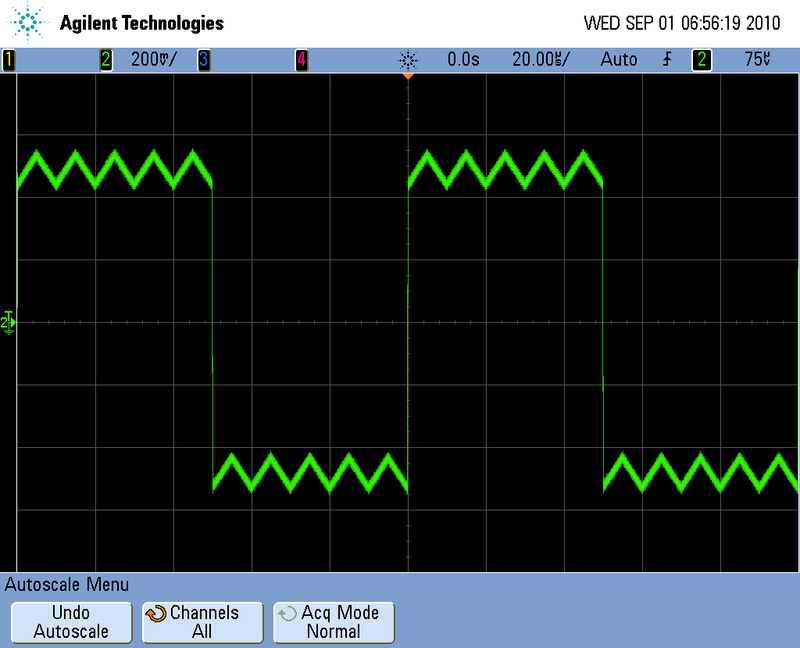 On the Aug 6th post (click here to go to Aug 6th post) I promised to follow-up with some more information on Agilent’s new 33521A and 33522A 30 MHz FG/AWGs waveform summing capability. The function can be accessed through 3352xA’s modulation menu. The sum feature allows you to mathematically add one waveform to another to easily create more complex waveforms. For instance you could do a ARB + sine wave or gaussian noise + square wave. The summing feature allows you to define the frequency and amplitude ratio (up to 100%) of the summing waveform. 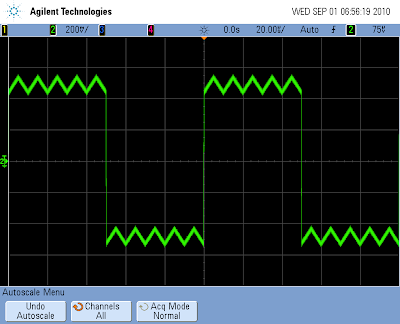 As an example, the scope screen shot shows a 10 KHz square wave with a 100 KHz triangle wave summed at 10% amplitude (kind of looks like Bart Simpson’s head). A great example application for the summing functionality is testing a circuit's noise immunity. For instance you could simulate a clock signal and add noise to it to see how it affects signals derived from the clock. Or you could add a 60 Hz sine wave to a custom arb waveform to simulate power line noise. I recently got a question from a 33521A customer asking how the waveform specs, such as jitter or harmonic distortion, change when using waveform summing. I think this customer was assuming that we use some type of analog method to do the summing. The answer is the waveform specs don’t change at all. The reason is because the summing is performed mathematically in the chip that creates the waveform points so you can think of the summing feature as an easy way to create an arb. Stuck on writing a term paper? Learn how to properly write a term paper here guys. Explore some more useful articles at this https://essayclick.net/blog/persuasive-essay website, my friends.